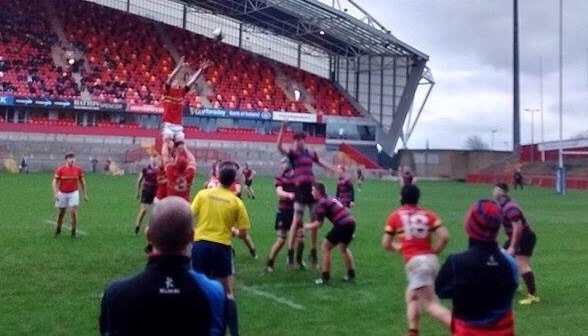 CBC have advanced to the Junior Cup Semi-finals after the outmuscling of a reslient Munchins side in Thomond Park. 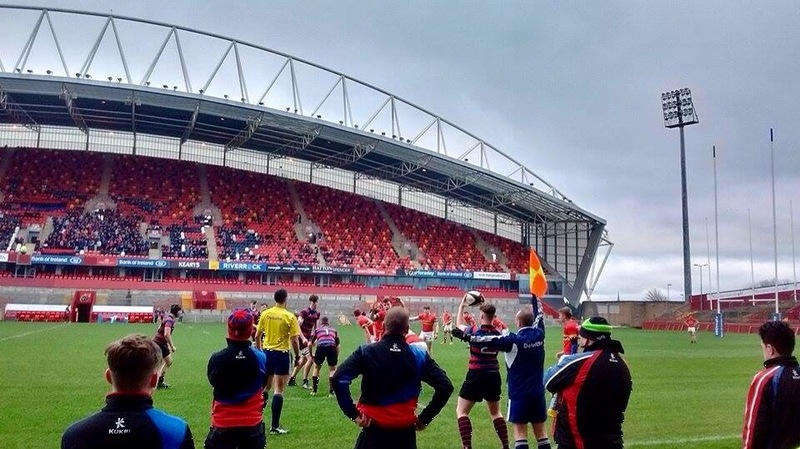 The match kicked off to some heavy CBC pressure with close carries around the halfway line. Munchins did occasionally have opportunities to regroup, forcing knockons regularly but it wouldn’t be long until they did likewise themselves each time. This proved the look of the game up until Chrisitian’s Outhalf Billy Caine slotted a penalty after 5 minutes, which would prove pivotal in the game that would follow. Munchins went onto have shortlived trips to the opposition twenty two midway through the half but that would change when the Cork school broke away, getting into the Munchins five metre line after time. However, the Limerick team’s defense was their best asset on the day and held out excellently with superb chop tackling just by the corner flag. Eventually, the opportunity arose for CBC to play it wide and only for a last ditch Alex Casey tackle beneath the posts, a try was imminent. Munchins had held on again and with a penalty within their own territory, Jazz Pendijito happily kicked out for half time. Five minutes into the second half and it was CBC on the racks. Pendijito found space on the overlap and burst through before kicking ahead. Sprinting onto the peg along the surface was centre Josh Neil and only for a minor fumble, the game could have swung in SMC’s favour. It remained 3-0. The visitor’s reply came fast and with purpose as after a prolonged attack with some tough carrying from Scott Buckley and co., centre Fergal Conway scampered in behind a stretched Munchins defense. Caine converted to make it 10-0 with less than 15 minutes to go. Perhaps CBC could have made the game out of sight soon after as they became comfortable in the SMC half. A yellow card to the Conway changed the flow however, handing their opponents a life line. Munchins needed some heroics at this point and to be fair to them, they showed the required heart when winger Kristan Lugod upset Christian’s with a neat finish in the corner. Compounded by Jazz Pendijito’s conversion, the game was by no means over – even if only five minutes were left on the referee’s watch. Unfortunately from their perspective though, that final killer instinct lacked from there on in as they fell to yet another quarter final defeat. Best of luck to CBC in the next round and commiserations to Munchins.